Geogrid is a flexible, synthetic meshed material manufactured specifically for soil retention and slope stabilization. Available in a variety of materials, sizes and strengths, geogrid can be an incredibly important step to creating a long-lasting retaining wall that’s functional and attractive. Installing geogrid is a simple process that can really give your retaining wall project much-needed longevity. This is a simple overview of geogrid installation portion of retaining wall construction. Before the geogrid can be placed, you must excavate the entire area. Check the location of existing structures and utilities before starting the excavation. Call Before You Dig! 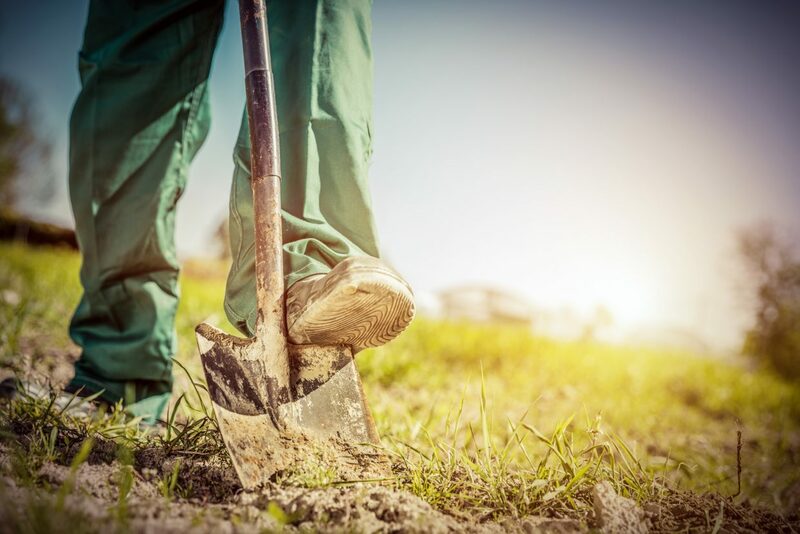 Call 811 before digging to protect yourself and other from unintentionally hitting underground utility lines. To begin the excavation, dig out a trench, removing the soil. The exact specifications of the trench should be calculated according to the maximum embedment length of the geogrid, the thickness of the leveling pad and the burial depth of the wall. A good rule of thumb is to plan for a thickness of at least 6 inches, or 150 millimeters, for the leveling pad and at least 10 percent of the wall height should be buried in the ground. In all cases, the wall should not be buried less than 6 inches deep. After excavation is complete, it’s time to cut the geogrid. Begin cutting sections from the roll to the specified length (embedment depth). Check your preferred geogrid manufacturer’s criteria for biaxial or uniaxial. In general, correct orientation is to roll perpendicular to the wall face. Once the geogrid has been cut in the correct length, it’s time to install. Roll according to manufacturer guidelines. Install the next course of block on top and then pin in place. Make sure to pull the geogrid past the wall face. Before securing, check the wall to ensure everything is correctly lined up and the offsets are correct. Once secured, cut any geogrid that is showing with a razor, and remove remnants with a torch. If your layer has been installed correctly over the geogrid, it’s time to secure. Pull taunt to remove all slack and loose folds. Stake or secure the geogrid before starting to backfill. Once taut, begin the backfill process in 8 inch or less lifts. Remember, never compact directly on the geogrid– it can damage the integrity of the geogrid, making it less stable. If you’re wanting to drive tired equipment over the backfill, you will need to have 6 inches or more in backfill in place before driving. Make sure to keep all heavy equipment at least 3 feet away from the edge of the wall. Retaining walls hold back potentially unstable wedges of soil and prevent erosion of land for a variety of purposes. Sometimes, a retaining wall needs the reinforcement of geogrid to do its job properly. Horizontal layers provide the necessary strength to hold the mass together and allow your retaining wall to do its intended job.